Praise the lord! Sister Act is back! The Broadway and West End smash hit based on the musical comedy starring Whoopi Goldberg and Maggie Smith is back for another run and this time X Factor star and hit singer Alexandra Burke is taking the lead as Deloris Van Cartier! When she witnesses a murder, she’s put into witness protection in the one place she won’t be found – a convent – where she’ll have a big impact on the other nuns. But will she be able to escape the clutches of her pursuers forever? This new production will have you singing hallelujah! As part of Open Treasure, Durham Cathedral are putting some of their most influential and historic texts on display to the public. In the new exhibition, they’ll be showing off the only surviving copy of the 1216 Magna Carta, as well as further issues from 1225 and 1300, and associated Forest Charters from 1217, 1225 and 1300. The six documents are being put on display together for the very first time, and will help to illuminate the ongoing significance of the charters and what they actually meant for Durham and the wider North East. With its restoration still underway, Auckland Castle still have its doors open to the public to attend their numerous heritage skills workshops, where you can learn a variety of crafts and skills from the past. This week, there’s the chance to sit down with Gill McCinley and create a piece of unique fused glass to take home with you. Fun, friendly and a unique, hands-on insight into some of the artistic methods of the past. 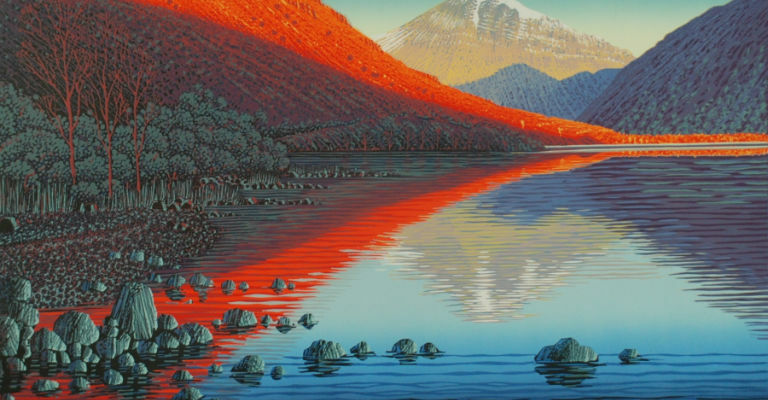 Never heard of the Cumbrian printmakers? You won’t want to forget them after this exhibition! They’re a group of 30 enormously talented aritsts who use a variety of printmaking techniques, from lino and cyantotype to screen printing and etching. As such, their work is highly diverse and shows off the sheer range of possibilities for printmaking. If you want to know more, each of their works is also accompanied by clear written information as well as photographs of the works in progress, so you can get a real sense of the true depth and craftsmanship of the art. When a genius commits murder, the plan is perfect. But is it enough to fool a fool? Inspector Drake is back to solve the most devilish plan yet – it’s got more twists than, er, something that’s got a load of twists in it. He’s investigating Dr Short, who married a Warthog and might have murdered his wife. Or did she murder him first? What happened to the taxi driver? Why’s there a lamp-post in the living room? Other strange and implausible questions! Will Inspector Drake be able to solve them? Will he be able to stop groping the suspects along the way? Who knows! Byre Opera are returning to The Maltings this week after their performance of The Turn of the Screw last year. This time they’ve got something that’ll delight both kids and adults in store with Janacek’s The Cunning Little Vixen. It’s a delightful, life-affirming tale of nature and man’s relationship to it, sung by a talented young cast and international design and directorial team. If you want to know more about the show, there’s also a Q&A discussing the production on 25th June, a fantastic opportunity to delve deeper into Byre Opera’s world. Love puns? Love Shakespeare? Then looks like the Phoenix Theatre in Blyth have just the show for you! Your Bard follows Professor Nother as he gives a talk on Shakespearian authorship in the function room of the Shakespeare pub – but he doesn’t believe anything the Bard actually says. So in comes Will to defend his reputation. Yep, you’ll be able to meet the man himself down your local, where he’ll tell you all about his family, what it’s like on tour and the glory days of the Globe. Whether you’re a die-hard Shakespeare fan or not, this one will have you raising your glasses! Also, don’t forget to enter our current competitions! Right now you could be in with the chance of winning tickets to winning the National Youth Dance Company at Dance City, Wynyard Hall’s upcoming Gin Festival or ‘Jane Eyre’ or ‘A Judgement In Stone’ at Newcastle Theatre Royal!